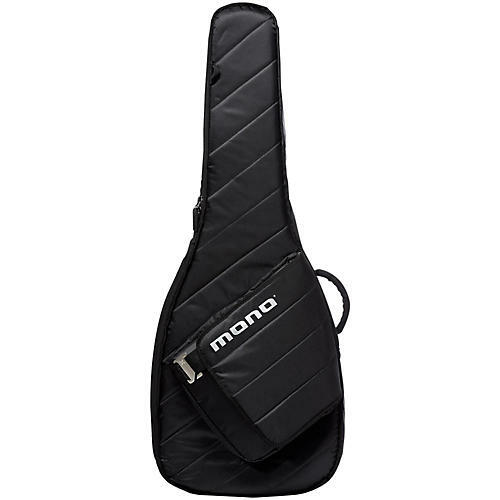 The Acoustic Guitar Sleeve is the latest addition to MONO's collection of professional luggage for musicians. Designed to be a minimalist solution for traveling light and simple, the new Sleeve collection of cases merges MONO's innovative protection and high-quality construction standards into a super slim and stylish design. Like the Vertigo, the Sleeve is top-loading for quick, stand-up access. There’s no need to lay the case horizontally to access the guitar because a hidden diagonal hinge makes it easy load and unload your guitar from the top. The Acoustic Guitar Sleeve features a custom acoustic guitar variation of the Headlock - MONO's patented neck suspension system. The Headlock is molded from solid, shock-absorbing EVA rubber to protect the neck and headstock from impact during falls. When your guitar is zipped-in, the neck is automatically secured inside the Headlock's contoured groove. At the bottom, the Sleeve features a super-slim EVA insole to keep the guitar body off the ground and protect the strap pin from bottoming-out when the Sleeve is put down too hard. The Sleeve features a messenger-bag style storage pouch that's perfect for small laptops, tablets, notebooks, cables and other extras that you might need when traveling light. A small interior mesh pocket keeps smaller, critical items close at hand. The Sleeve is built using only high-test materials with extreme resistance to abrasion and the elements. Outside, the water-resistent shell keeps you on the move, rain or shine. The Acoustic Sleeve is designed for standard dreadnought model acoustic guitars. Most archtop guitars will fit as well. Guitar Sleeve pouch internal fitting dimensions are 12" wide x 10" long (short side), 14.5" long (long side), and can be filled up to 2.5"- 3" deep. Contains a super slim EVA insole to keep the body off the ground and protect the strap pin from bottoming-out.